There is a special vocabulary for knitters. A UFO is an unfinished object, and a WIP is a work in progress, and DISO means you are almost finished with something but ran out of yarn so you are desperately in search of some more of it. These words are a shorthand knitting language. Then there is the SABLE, which means stash acquired beyond life expectancy. I have been working hard since October to finish some projects, and have sprinkled pictures of them throughout this post. All of them have been completed in the past two months. What does one do when you have a big stash? You can destash, knit faster, or revel in the fact that you have enough yarn to stock a small yarn store. Scratch that because you actually do have a small yarn store in your house. Where do you store your yarn? If you’re like me, it’s easy to succumb to the temptation to hide yarn in every closet and cranny. That way you don’t see it and therefore it isn’t really that big. There’s only one problem with this strategy. When you want to put your hands on a skein of yarn, you can’t because you can’t remember where you put it. And, when you move to a new house the jig is up because your darling spouse finds your hiding storage places. I don’t have a storage issue in my new house because I have more space. I have the yarn in two places: in my lower level with my books and sewing paraphernalia; and in the closet of the spare bedroom where I have yarn I want to get rid of. Sorry, there is a third place. I have a small stash of yarn in my bedroom. This is the projects I am about to start, have just started, or need to finish up. Still, I haven’t sorted it all out and some of the yarn is in random boxes without labels. In any move you get to the point where you are paralyzed by the enormity of it all, or just worn out. Eventually you pull yourself together and get back to it and finish the job. In the midst of the move I had to make a few trips to see my parents and focus on their care. Now I am awaiting a small shipment of furniture and other items from their house. Yikes! More stuff! 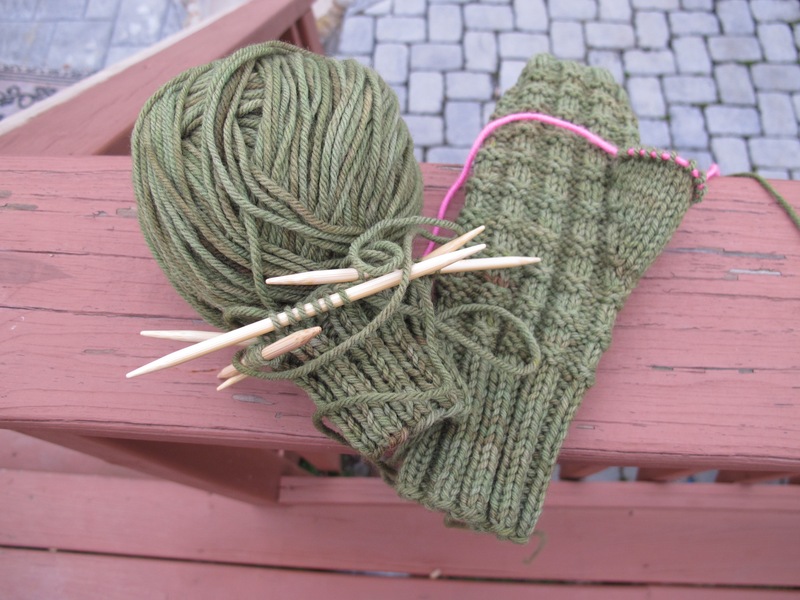 What’s a knitter to do? Knitting as stress relief . . . who are we kidding? Knitters often extoll the benefits of their craft. Knitting is relaxing, it gets you into a place where the rhythm of knitting relaxes and soothes you. Until, that is, you make a mistake and have to frog it (rip-it) back and re-do a particularly difficult section. There are so many moments in knitting when you want to put your project in time out, put yourself in time out, or have your head examined after you just spent a good part of the day working some really complicated cable pattern and then discover a mistake on row three. This is when the four letter words start flowing and you think about having a drink. Hmmm . . . how does alcohol mix with knitting? Shall we ask Baby Cocktails?? She has come up with the ingenious combination of knitting and mixed drinks. So how does that work, the relaxing knitting thing, you ask. There are other reasons why people knit. For one, it’s a creative process whereby a ball of yarn becomes something you can wear or give as a gift. It releases those creative juices. You want an aran sweater like the one you saw at the mall, but shorter and with a staghorn cable down the front, and plain sleeves. Done! You liked the sweater in the catalog, but instead of cotton and modal (what the heck is modal anyways?) you want to make it in a linen-cotton blend with a little nylon for stability. Done! Your best friend needs a shawlette to go with her new winter coat, and she wants lace but not too much. Done! Will be gifted to my friend Michelle in Canada after I block it. Nurmilintu. Knitting is portable. Since some initial knitting needle bans after 9-11, most airlines allowed knitters and their stuff back on airplanes. I mostly use the circular ones, which are analagous to a pencil attached to a plastic cable. Is it possible to highjack an airplane with a pencil and a plastic cable? Probably not. Your plane is delayed and you’re stuck in the airport for two extra hours. No problem, you can knit a few more inches. The doctor is late coming back from doing rounds. No worries, you can knit while waiting for her to get back for your appointment. Maybe this is where the relaxing part comes in. It’s like going for a long drive with a book on tape. Traffic? Hooray! Another two chapters on that thrilling novel you’re listening to. When we travel my darling spouse does the lion’s share of the driving so I can knit. We have a deal: I get to knit and he gets to listen to his sporting event of choice on the radio. It’s a win-win situation. If I’m really desperate I can put on my headphones and listen to a knitting podcast while I knit. How about that for multi-tasking!! Let’s get back to the SABLE problem. 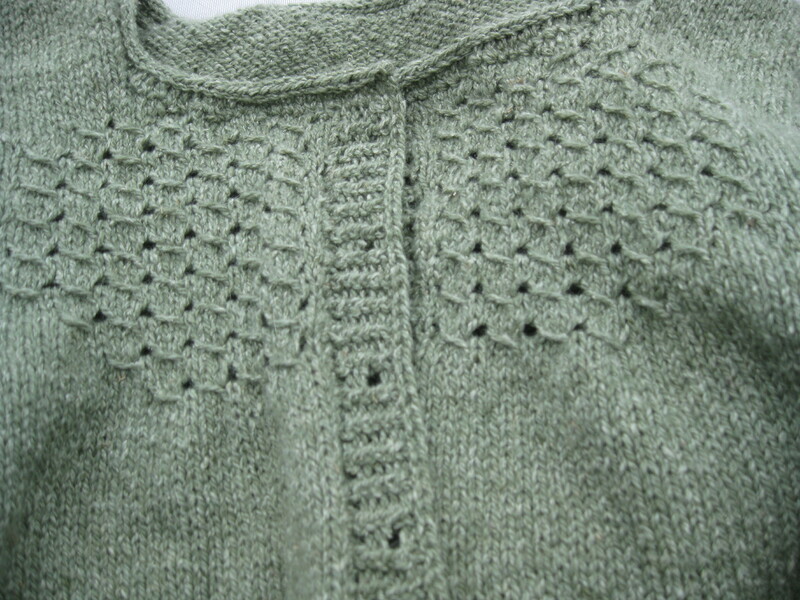 Given that I do more with my time than just knit, a lot more in fact, I probably fall into the SABLE category. Being in the SABLE category means you likely have a lot of SQ. 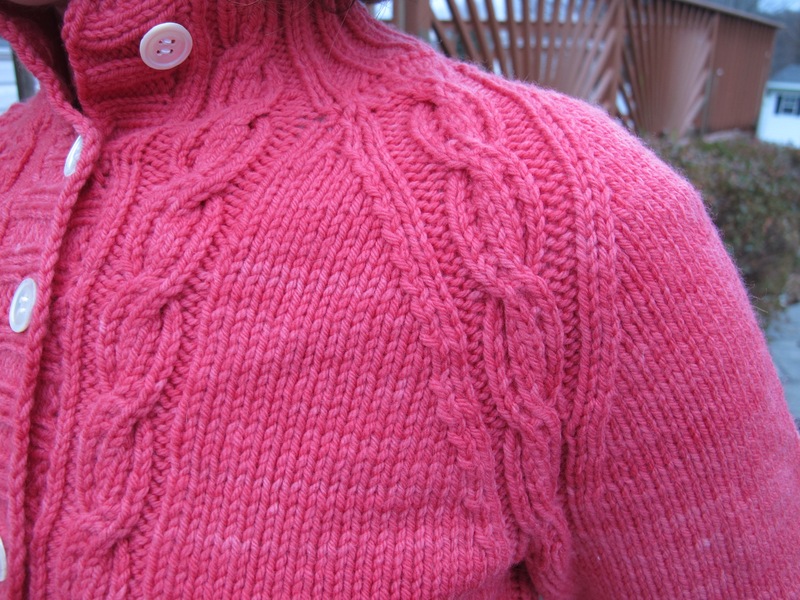 These are sweater quantities, four or six or more skeins of yarn to make a complete garment. At the time you bought them you had something in mind that would be the most beautiful thing you had ever made, in style, hot off the press, and boy, was it going to be fun to knit. Here’s the problem: when you bought that yarn, you already had two or three other projects on the needles that you had to finish first. So, that SQ got put away with the rest of the stash, maybe under the bed or in the guest room closet, and when you were ready to use it, another shiny object came along. Then there’s the one topic that is taboo. Yarn costs money, sometimes a lot. How many of you have waited eagerly by the keyboard for the Plucky Knitter update or the Shalimar Yarn update (only during the workday, what’s with that?) How many are at the computer as we speak snapping up some more loveliness at the Miss Babs gratitude sale. Don’t tell anyone, but I partook of this one too. But this is small fry compared to the yarn clubs. How do they work, you ask? Well, a particular dyer gives you the opportunity to sample a number of different types of yarn over time. 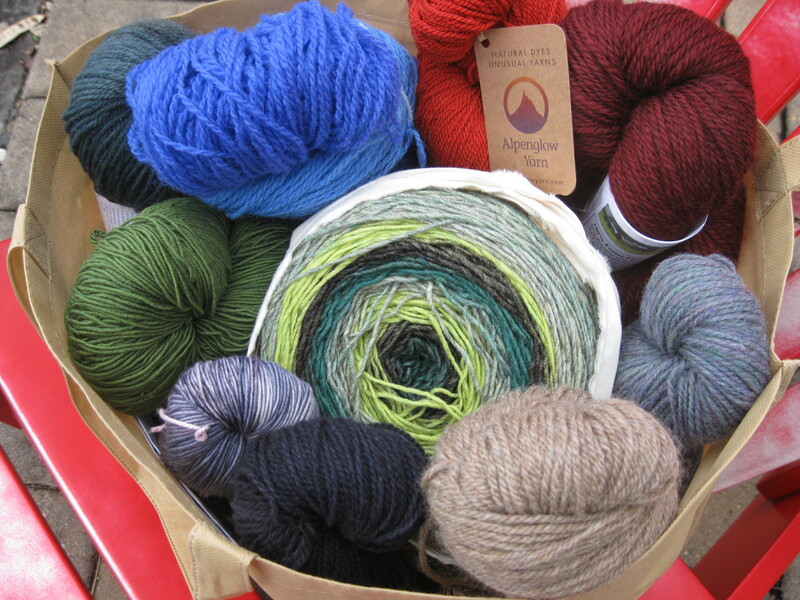 Typically, over a six or twelve month period you get yarn shipments every month or two. It’s like the fruit club, but instead of grapefruits in January and pears in July, you get Polwarth silk in March, and Bluefaced Leicester in May. 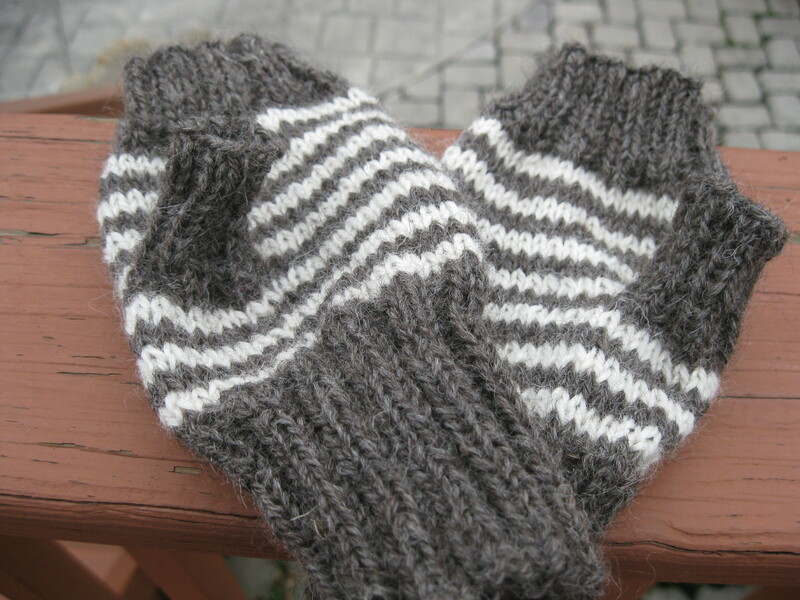 If you are very lucky, you will also get a “gift” along with the yarn and a pattern. Are you feeling faint yet?? Imagine the scene at the mailbox when the package arrives with your two lovely skeins of yarn, a pattern that has arrived in your digital mailbox, and a packet of stitch markers and some fruit tea. It’s just like Christmas but it happens more often. 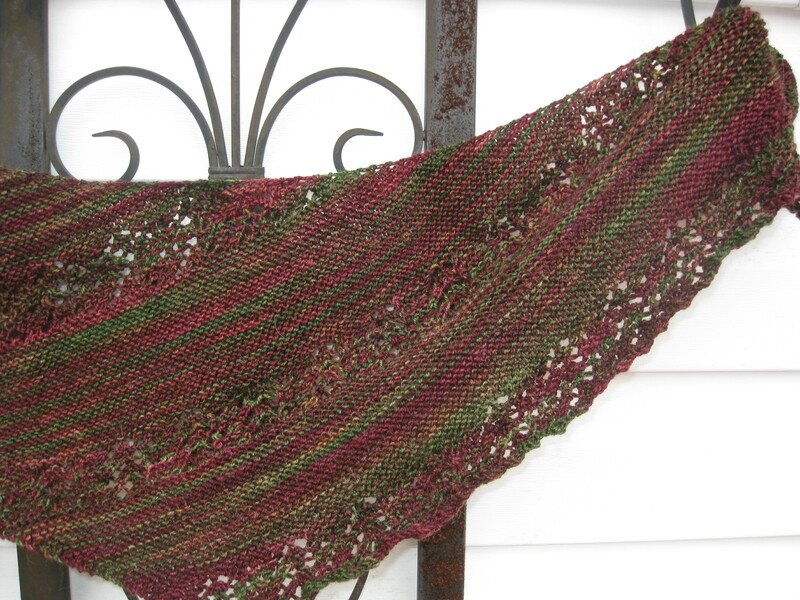 I have partaken of a few yarn clubs, and they are all fabulous. I have been the proud recipient of shawl pins and project bags and dried fruit and the like. Here’s the problem. Now, on top of your regular knitting you have to figure out how to knit an additional six projects a year. The first skein comes and you are busy. Then, wait! the second arrives, and they just keep coming. How do you keep up! So, much of this yarn goes into your stash, joining the other unloved skeins. My record is usually one project per yarn club. I finally had to walk away from the keyboard. Is there a twelve step program for yarn clubs? Don’t get me wrong, I loved the yarn clubs. Talented, creative people selecting their lovelies and matching them with patterns and goodies, and arriving at your doorstep. But they require preparation. You need to clear the decks, take time off from other obligations, fill the freezer with pre-made meals, and get all the laundry done. The hype is excrutiating. Everyone is out there waiting for their membership, holding their breath in case they run out. Did I get mine in in time? You preset your computer to the website to save time. You log into Paypal. The craze of it all takes over and you may forget why you wanted the yarn to begin with. Then you realize that you don’t need any more yarn, but hey, three hundred other lucky knitters in the world are getting it, so darned if I’m not getting some too. Some of this will be knit into an FO that will be loved or gifted, but unfortunately, a lot may end up in the stash or be destashed. Which adds to the ever growing SABLE. In the old days life was simpler. There was Vogue Knitting, and Interweave Knits. There was no Ravelry. If you wanted yarn or a pattern you had to go to the store. These knitting magazine came out four times a year. You had a subscription and saved all of them, in order, on the shelf. All the greats sold their pattern to these magazines. Then something happened. Instead of getting 10-20 great patterns in your magazine, you had to buy them individually, and then pay to print them out. Great for the designers, more expensive for you. In the olden days most knitters were product knitters like my mother. My mother went to the store where she got help to pick out a pattern, and then might have bought the exact same yarn the pattern called for. She went home and cast on a few days later. You see, she didn’t go to the yarn store until she actually needed another project. Why would you go shopping for yarn or a pattern if you didn’t need to? Welcome to the age of online shopping and digital patterns. Worse yet, we now buy not because we need a pattern, but because we can. We didn’t need more yarn or more knitting books, but everyone else was buying Jared Flood patterns and then Quince came along, and OMG suddenly there were a dozen or more really nice knit pattern designers and new patterns were coming out practically every other day! Double yikes! Still, we bought them and stored them in our Ravelry library and bought yarn for them because everyone else was doing it, and we wanted to be in the in crowd that was making color affection and whisper cardigan and February lady. Wait! What about Veera’s new collection, and the new Baby Cocktails, and Custom Fit, and Joji’s new pattern . . .
What’s a knitter with a SABLE problem to do? Leaving alcohol out of the equation we are left with a few options. The first one, which is only possible to do with serious discipline and willpower is to go through your stash and dispose of everything that you are not planning to make anything specific out of in the next two years. Alternatively, you can just stop buying more yarn. The problem with this plan is that there is always new yarn and new patterns to go with it, so you won’t get to hang with the cool kids on Ravelry who are buying this stuff. Yes, it’s a complicated issue. At the end of it all is the brutal fact that even if you did have time to knit up all this yarn, where in the bleeping bleep are you going to put all the FOs? Are you going to build another room on to your house and line it with shelves and closets to store all those sweaters and scarves and hats and socks? And, since you have already reduced your wardrobe, how many sweaters can you wear in a lifetime? Charity and giving is always a good option. I have sold some of my stash on Ravelry for less than cost, and feel good that it is going to a new home where it will be loved. I try not to think that someone like me has bought and is adding to their already too large stash. I try not to think how superbly ridiculous it is to sell yarn at a loss. There are a number of charities that are always looking for contributions of yarn to knit preemie hats and blankets, and similar items. 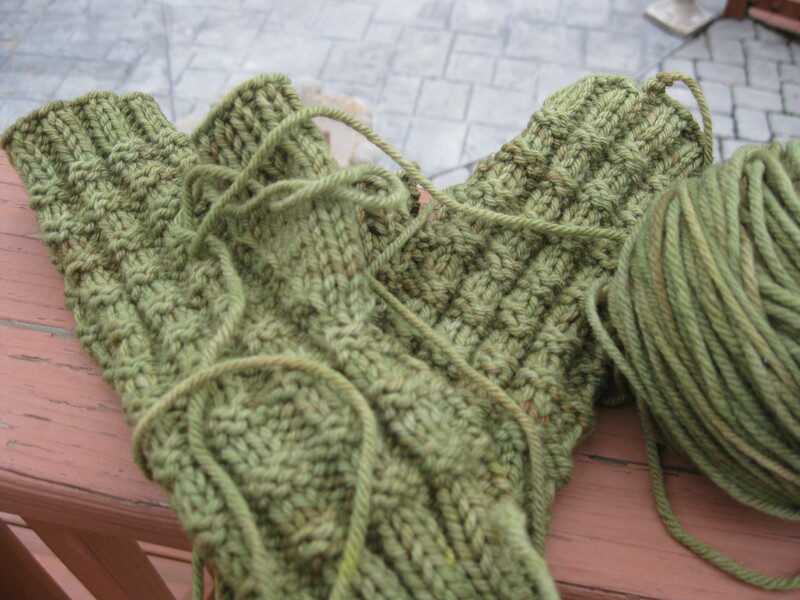 The problem is that they don’t usually need hand-dyed merino wool. They want acrylic or super wash wool, which I don’t tend to buy. You can give yarn to the local thrift shop so knitters with smaller budgets can get nice yarn. I’ve done that as well. You can take a tax write-off for this if you itemize. So, you have given some of your stash away, sold some, knit some, and still it’s there, taunting you like that cute dress you bought on sale at the mall that was a bit unrealistically small. The dress is there, year after year, hanging in your closet, until you can’t remember why you bought it in the first place. If you have clothing with price tags still on them you may also have a SABLE. You can’t help it, the yarn spoke to you and you had good intentions. It just didn’t work out for you. Just need to sew on buttons. Audrey in Unst. I have stopped buying yarn at yarn stores. After all, I attend the two largest sheep and wool festivals in the country each year, New York and Maryland. 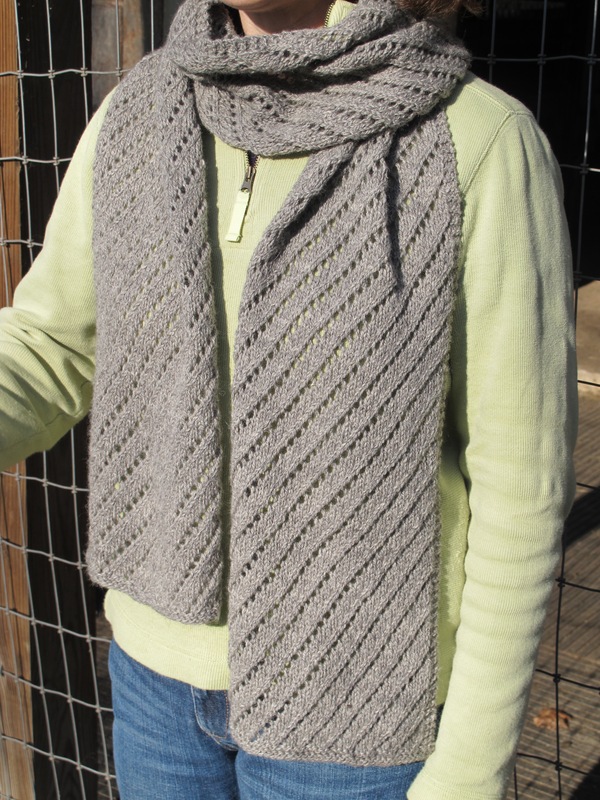 On top of that, I get newsletters from a number of independent dyers about new yarns, new colors, and, new patterns. Despite the amount of knitting that I do, I can’t keep up. In my defense, I do finish items, I do wear them, and I give a lot away to friends as gifts. This makes me feel very generous. It’s ok to buy more yarn, because it’s going to be a present for so and so. We continue to tell ourselves these little white lies, and we spend money on hotels and tolls and bask in the color and texture that is the fiber industry. We can’t help it and we don’t care. This craft gives me that warm glow of creativity and the satisfaction of making something that I can wear. I’m going to keep on buying yarn and patterns. I will keep chipping away at my big pile of yarn with the knowledge that my stash may outlive me. And it’s going to be a life of color and texture and and the coziness of being wrapped in fiber. What’s my plan, you ask? How will I make sense of this insanity? Am I going to leave my yarn on the sidewalk like a giant yarn freecycle? No bleeping way I’m not. All that lovely yarn I’ve collected lovingly selected over the years? All that money invested? I have bigger closets now and more time. I am buying less than before and I am not tempted much to buy something I have no intention of knitting. I’m donating some knitting books to the library. Then lots of people can enjoy them. I finished a UFO yesterday to today I’ll start another project. I’m also trying to be more monogamous. Maryland Sheep and Wool is four months away. I have time. Besides, knitting is relaxing and I bet it will add years to my life. That will give me more time for knitting! ← Twas the night before Christmas . . . I know, I imagine any creative craft tends towards this habit of (over) acquisition. You want to have some of everything that you might possibly ever need, so when you see something new, you must buy it. I’m finding that my tastes have changed and I am leaning more towards less processed and more unique wool. Thus, I am buying more rare breed fiber and less merino. It’s in the same vein as eating heirloom tomatoes. Knitting gives me so much aesthetic pleasure I try not to think too much about my SABLE problem. I ended up with both fabric and yarn from my aunt’s stash after she passed away. It’s a joy to have as it reconnects me to her when I use something, or even when I just happen to look at it. There are even some left overs from items she made me from my childhood. These things from our family keep us tied to the past. Do you have any plans to use any of the yarn or fabric? That way you would have a permanent reminder every time you wore the item. I have my mother’s dining room set arriving next weekend. The days of formal dining are over, but I couldn’t let it go and my siblings didn’t want it. She cared for it lovingly and every time I use it I’ll think of her. I have a few other treasures too, like an embroidered tablecloth from my great grandmother, but I don’t dare use it. I wish there was a way to take them out and get some pleasure out of them. Definitely plans – have made a skirt for my daughter from left over fabric my aunt had kept from a dress she had made my mum. Smile and think of both of them every time I see it.